This means, "word-changes for women" are made by adding unnecessary additions, attached to normal speech. Though it is not known publicly, these "word-changes for women" were made in a hurry during the Meiji period, and did not exist before then. It originated in drills for schoolgirls, held at "women's schools" during that period, and until the Edo era, men and women spoke in exactly the same manner. "You can do it more casually, okay?" "Hmm. . . Well, that is all right. But I am not very interested in fashion for men. Though you all definitely are." "Possibly, yeah. Though I do not think of you, brother, to be very unrefined, I cannot imagine you being very interested in fashion." "You also do not like having a boy who makes himself up like a male model in a men's magazine as your close relative, do you?" "I see. I do not think you are not like that kind of person. . . But I do not like it." "You see? So, well, that kind of thing--"
"Just a moment. Since I will prepare, can I request it?" She was about to pounce. She has the talent of being foxy. As this trait is inherent to her, she can really be quite the pixie. "What do you want? Well. . . you mean like you make available for me the means, like a male model magazine for men, and have me metamorphose you into to a male model with that material, right?" "Yeah. You are at a loss for the outfits, right? Then, I can provide assistance." "Ah well. . . if you say so, I do not mind but. . ."
"Then, as a reward, I will transform you, brother, into a girl clad in whatever outfit you prefer." "No. . . That is the very thing I mind." "Umm. . . well, I am glad to have a life-sized dress-up doll." "You should not ignore my feelings." "Be patient about that. Well, you should not be sentimental about it, but businesslike. Oyamas1 always dress in women's outfits." We were going to discuss what we should do from now on, but now we are discussing about how we should be dressed up instead. "Ah, anyway. You should stay more aware of keeping me male. For sure." "I see. I do not have any better ideas." "Again, please stay more aware. I do not want a situation, like what I had in the train car." "Say no more! I already apologized for that!" When taken literally, it might seem like they are quarreling, but in fact they looked very happy. They looked just like a brother and a sister, or perhaps like intimate lovers. "From now on we will have many things to do, sometimes the second year students will stay at school while the first year students get to leave. It will be too much for me if, suddenly. . ."
"That's right. . . Not only is it too risky for us but I also have to refrain from being too relaxed in my room." "I think it is too bad but. . ."
"It will be the same for you, brother. Stay wary when in your room, okay?" ". . . I see. That's right." Ayumi looked down steadily at her own body. 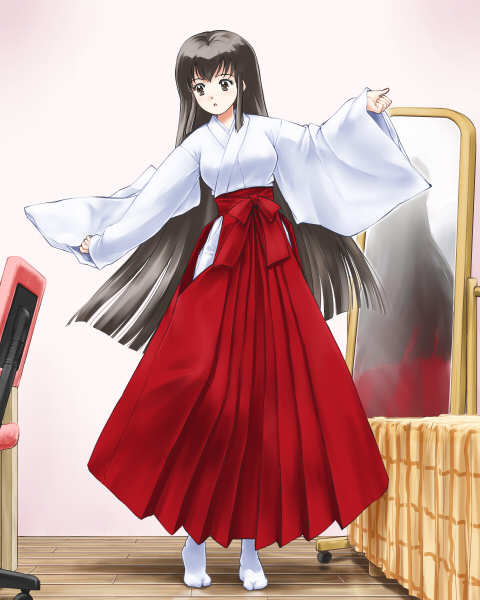 Since she was in a sprawled seated position on the floor, she could not tell whether her height had changed, but she found that the spread-out hakama3 on the floor looked nothing but kawaii on her. ". . . Kawaii. . ."
". . . You did it." Ayumi replied as calmly as possible. She felt that her voice had altered. I do not know why, but Satori always transgenders me into a girl with very long hair. This time as well, my hair is long enough to reach the floor, and the nape of my neck is covered by a huge amount of that hair. Honestly, I feel hot.